of a deeply troubling chapter in recent American history"
Domestic Television Winner: "Torturing Democracy", Sherry Jones, Washington Media Associates: Meticulous reporting unravels the inside story of how torture was adopted by the U.S. government as official policy in the aftermath of 9/11. With exclusive interviews, explosive documents and rare archival footage, the documentary has been called the definitive broadcast account of a deeply troubling chapter in recent American history. 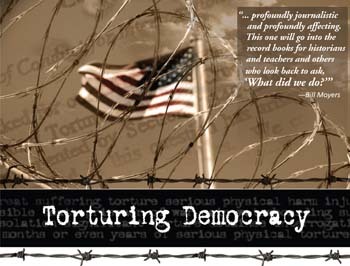 The entire film can be viewed at the companion Web site, www.torturingdemocracy.org, along with key documents, a detailed timeline, the full annotated transcript of the show, and lengthy transcripts of major interviews carried out for the film. Hosted by the National Security Archive at George Washington University, the Web site will ultimately include a complete "Torture Archive" of primary sources.